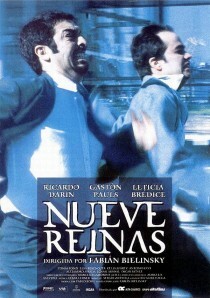 Nothing is as it seems in Fabián Bielinsky’s fabulous Argentinian crime thriller, Nine Queens. This award-winning film, set in the world of con men and thieves in Buenos Aires, follows a couple of grifters as they go about their daily lives of making money through deception. As the story unfolds, the plot thickens and the stakes go up in a very clever way. Superb performances from central actors Ricardo Darín and Gastón Pauls coupled with taught directing and a wonderful script containing a number of clever twists make this film a tour de force. You can find more information on this Spanish-language movie on Wikipedia and IMDb. Another sweet film – really like the angle you’re taking here. I remember watching ‘Criminal’ and thinking, HEY, I’VE SEEN THIS BEFORE… but only about 30 minutes in. Then the Matchstick Men… then every other con-artist film since. Definitely one of the best, and most memorable in the genre. Stamps stamps stamps! Similar review on my blog. I think we are singing from the same song-sheet here! Pete.